This is a delicious side dish I made the other night. I love lentils, so I was really excited to try this recipe! 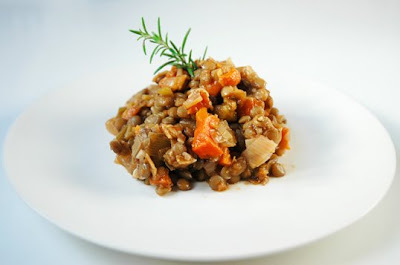 These lentils would be paired perfectly with any type of fish although any type of meat would also work! We had ours with parmasen crusted chicken…Yum! Place lentils in a bowl and cover with boiling water. Let soak for 15 minutes. Drain. Heat olive oil in a large saute pan, add the onions, leeks, thyme, salt and pepper over medium heat for 10 minutes. Add the garlic, celery and carrots and saute for an additional 10 minutes. Next, add the lentils, chicken stock and tomato paste, cover and simmer for 20 minutes, or until the lentils are tender. I like my lentils to have a bite to them, so these cooking times are for al dente lentils! Hey Danny – I like the rosemary hat your lentils are wearing. Nice photo. I love lentils too, especially green ones. Here’s a recipe for warm lentil salad that I think is great. A bientot. Assume 3/4 applies to pepper. Not clear where the red wine vinegar fits in. Any ideas?